Share your RAWthentic experience with your furry best friend. The RAW Squeaky Dog Toy is a (joint) cone shaped toy that's made out of natural hemp. Being a durable, non-toxic fiber, hemp is a safe and healthy pet toy choice. Hemp also comes with the added benefits of being antibacterial and antimicrobial; a huge plus for you and your dog. 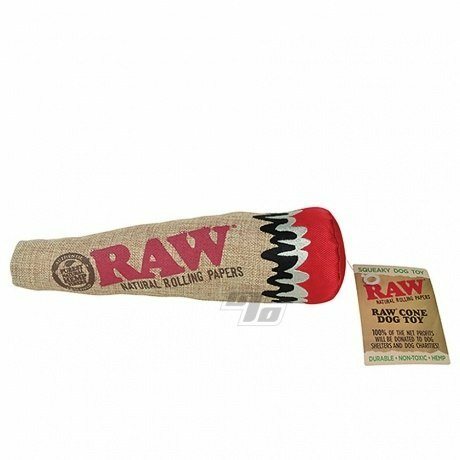 This squeaky dog toy is limited edition, made by Dooby for RAW Rolling Papers. 100% net profits donated to dog shelters & dog focused charities! I normally don’t splurge on dog toys since he’s such a fierce chewer. With a little bit of coaxing on my part to not pull or tear at it, this is my dog’s prized possession. He even holds it at the end, as if he’s smoking it. It’s actually remarkably sturdy. Totally will buy again.